Promote your canine’s health and overall wellness with Pet Health Market’s affordable selection of discount pet supplies. From the dog’s fur, eyes and ears to its digestive system, bones and joints, we’ve got all the dog grooming supplies and other meds you might need to keep the pup healthy, inside and out. Liver Biscotti Small Bite Dog Treat Original Recipe 8 oz. 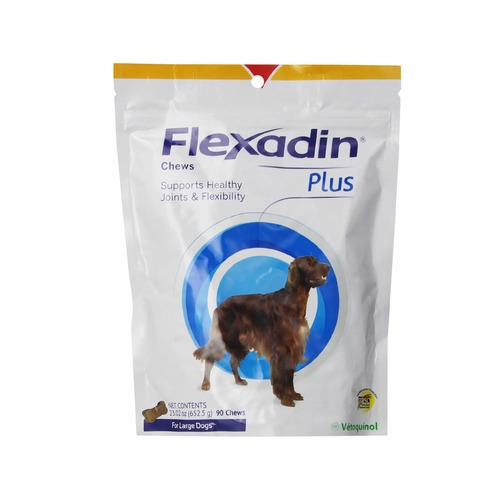 Flexadin Plus Chews - Vetoquinol is a comprehensive joint support formula for dogs. Formulated with Glucosamine, Perna, MSM, Creatine Monohydrate, Omega-3 Fatty Acids (EPA and DHA) and Antioxidants for optimum joint health support. 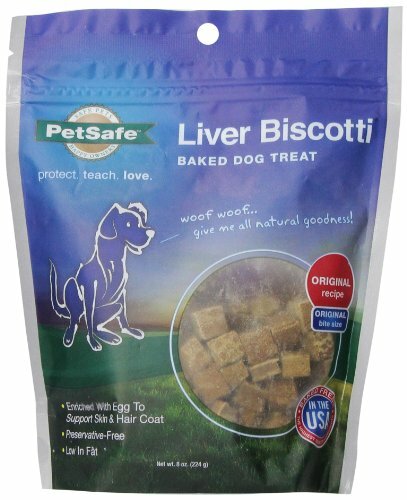 Liver Biscotti is a natural treat for dogs baked from scratch in the United States. These are wholesome, delicious treats, low in fat and irresistible. Wholesome ingredients include wheat and eggs. Synovi G4 Soft Chews - BayerDVM is a comprehensive joint health and synovial support supplement combining Glucosamine, MSM, Creatine, Omega-3 Fatty Acids, Antioxidants, Vitamins and Minerals in a highly palatable poultry-liver flavored soft chew. Enriched with Boswellia serrata and Turmeric to support overall joint health. Greenies satisfy your dog's natural desire to chew. The consistency/ingredients have been shown to help reduce odors, control dental tartar (calculus), strengthen gums and diminish oral bacteria. Sergeant's Pur Luv Grande Bones For Medium & Large Dogs - Peanut Butter are an irresistible and long-lasting dog treat that promote healthy teeth and gums. Low in fat and rich in flavor and nutritious ingredients. Contains omega fatty acids and no animal by-products. FortiFlora is a unique supplement containing live active cultures and is recommended for the dietary management of dogs with diarrhea. It tastes great and can be easily sprinkled on a dog's food. Monoject Syringes are high quality, autoclavable, sterile syringes with detachable needle. Each syringe is offered in individual rigid plastic package. Greenies satisfy your dog's natural desire to chew. The consistency/ingredients have been shown to help reduce odors, control dental tartar (calculus), strengthen gums and diminish oral bacteria. Monoject Syringes are high quality, autoclavable, sterile syringes with detachable needle. Each syringe is offered in individual rigid plastic package. Greenies satisfy your dog's natural desire to chew. The consistency/ingredients have been shown to help reduce odors, control dental tartar (calculus), strengthen gums and diminish oral bacteria. Thermometer Probe Covers fir most Digital Thermometers and most other Digital and Glass Thermometers. Eliminate the disinfecting process by discarding the cover after each use. Greenies satisfy your dog's natural desire to chew. The consistency/ingredients have been shown to help reduce odors, control dental tartar (calculus), strengthen gums and diminish oral bacteria. Dispenser pump is designed to fit most one gallon size containers. Use for shampoos, conditioners, supplements, disinfectants and clean supplies. CarePoint Vet offers a polypropylene hub disposable needle that is designed with an ultra-sharp tip for comfort. Needles are individually packaged, sterile and latex-free. CarePoint Vet offers a polypropylene hub disposable needle that is designed with an ultra-sharp tip for comfort. Needles are individually packaged, sterile and latex-free. Vet One Cotton Tipped Applicators are non-sterile applicators designed with USP-grade cotton on sturdy 6” birch wood stems. Used for a variety of healthcare purposes, including specimen collection, removal of debris, wound treatment and medication application. These products are manufactured in an ISO 9002 facility. Packaged in autoclavable bags. Bowser Beer is a non-alcoholic, non-carbonated beer for dogs. All ingredients are healthy and made from scratch. Malt barley for shiney coats and glucosamine for joint health. Packaged in 12 oz. plastic recyclable bottles with re-sealable caps. Bowser Beer is a non-alcoholic, non-carbonated beer for dogs. All ingredients are healthy and made from scratch. Malt barley for shiney coats and glucosamine for joint health. Packaged in 12 oz. plastic recyclable bottles with re-sealable caps. Bowser Beer is a non-alcoholic, non-carbonated beer for dogs. All ingredients are healthy and made from scratch. Malt barley for shiney coats and glucosamine for joint health. Packaged in 12 oz. plastic recyclable bottles with re-sealable caps. Sterile, single use hypodermic Terumo needles. Silicone coated for easy penetration. Terumo needles are a favorite to use for subcutaneous fluid administration. Extremely sharp and unique bevel design provides comfortable injection. Oral Medication Syringe is used in for the administration of medications and in feeding liquid diets. Latex-Free. After filling syringe, place cap on syringe tip to prevent leakage of medication. Syringe barrel graduations 0.1 ml [1/8 tsp]. Monoject Syringes are high quality, autoclavable, sterile syringes with detachable needle. Each syringe is offered in individual rigid plastic package. Monoject Syringes are high quality, autoclavable, sterile syringes with detachable needle. Each syringe is offered in individual rigid plastic package. Glass thermometer with protective plastic case. Oral Medication Syringe is used in for the administration of medications and in feeding liquid diets. Latex-Free. After filling syringe, place cap on syringe tip to prevent leakage of medication. Syringe barrel graduations 0.2 ml [1/4 tsp]. Sterile syringe with detachable needle known for extreme sharpness. Clear syringe barrel with bold, precise scale markings. Translucent needle hub for quick observation of flashback. Blister packaging is tamper evident and cost efficient. PetFlex No Chew Bandage is a flexible, cohesive bandage with a bitter taste to help prevent chewing, biting and tearing of the bandage. PetFlex tears cleanly by hand, will not constrict, does not stick to skin or hair, and stays in place. Vetrap is a strong, lightweight and comfortable elastic bandage that sticks only to itself and will not slip or loosen once applied. Measures 2" x 5 yards. Vetrap is a strong, lightweight and comfortable elastic bandage that sticks only to itself and will not slip or loosen once applied. Measures 2" x 5 yards. WEBCOL Alcohol Preps feature a premium, nonwoven pad material saturated with 70% isopropyl alcohol for effective scrubbing and cleansing. Size: Medium, 2-ply. Individual sealed pouches. Keep your dog looking its best by consistently grooming him or her. We have a huge variety of doggy shampoos: itch-relieving dog shampoo, a sensitive skin shampoo, flea treating shampoo, soap-free, waterless dog shampoo and much more. On top of shampoo, you also want to make sure you’re keeping the dog’s fur at an appropriate length and brushing him often to remove that hot undercoat. Pet Health Market stocks veterinary-trusted, brand name dog brushes and combs that feel good against a dog’s skin and get the job done. Don’t forget about your puppy’s paws! Keep the canine’s claws short and healthy by frequently filing or trimming its nails. We stock both files and dog nail clippers so you can ensure the dog nails never get too long, which can cause painful and harmful health effects. Nail trimmers are one of the most important dog grooming supplies to think about – if you’re brave enough and your pup trust you enough near its nails! We also have everything you need to clean out your pooch’s ears, eyes and teeth. The popular tear stain removal products keep the messy discharge out of your dogs’ eyes. For those adorably floppy ears, we stock ear astringent and ear cleanser to keep them clean and dry. All of our dog grooming supplies are discounted, lower priced than you’ll find at traditional pet stores or vet offices! You’ll do your best to keep your pet looking its sharpest, but what about those pesky pests? On top of grooming, don’t forget to protect your dog against fleas and ticks. With our variety of flea medication options, you can choose a variety of ways to combat those harmful pests. Probably the most popular, our topical flea medications are one of the strongest and surest ways to keep flea eggs and ticks away. You’ll find flea medication from trusted brands like k9 Advantix, Advantage II, BIO Spot and many more online here at Pet Health Market. For annual dog vaccinations like those against canine distemper, parvovirus, bordetella, parainfluenza and others, you can administer those at home at a much lower cost! If you’re not woozy at syringes, injecting your pet’s medications at home is a budget-conscious way to go. We have a variety of dog vaccines online, dog vaccines that are used and trusted by your local veterinarian’s office. You can even stay on track of your dog’s diabetes with our dog diabetic supplies – including test strips and glucose monitoring strips. Along with the external appearance of your dog’s fur and nails, help your dog maintain a fit body weight to ensure the healthiest and happiest life possible. Along with dog weight control products, we stock dog vitamins and joint supplements for dogss to really get your canines all the nutrients he or her might need. Shop online for discount pet supplies at Pet Health Market; on top of the low, low prices, you’ll receive free shipping for orders over $79!